MAN UP! : British Lawyer: Stop the Gay Agenda NOW! Britain's most prominent pro-family lawyer told activists at the MassResistance Banquet on Sept. 18 that they had better fight now or it will be too late. English Barrister Paul Diamond has been involved with numerous high-profile cases in the UK and also on the European continent defending pro-family people against the tyranny of the state and corporations. Barrister Paul Diamond made a huge impression with his description of what's happening in Britain and his assessment of the state of affairs. He gave a riveting talk and answered questions about what's happening in Britain right now, and how America is on that same horrible path unless we take action now. He came to the US exclusively to speak to MassResistance, and during his stay was also interviewed on several radio stations in Massachusetts and across the country. His message was blunt: "You've got to stop this now in America while you still can." Diamond compared today's U.S. society to Britain's in 1997. "We thought it was stable; we'd had centuries of religious tolerance," he said. Then in 1997 came a huge change in the political culture. "Human rights, equality, and non-discrimination" became buzz words backed by law, and began to be forcefully enforced against Christians by the courts. Now 14 years later, a British couple cannot be foster parents because their Judeo-Christian beliefs are considered "homophobic." A judge ruled children must be protected from "infection" by such beliefs. The hostility of judges against religious people has even extended to their being considered as "terrorists," he said. Anti-discrimination laws have become tools to discriminate. Diamond's personal "terrifying wake-up call" came in 2004 when a 70-year old street preacher was knocked to the ground and beaten by a gang of 30 youths because he unfurled a banner urging people to leave homosexuality and return to Jesus. Rather than arresting the attacking gang members, British police arrested the victim; they charged the preacher with inciting the attackers by "speaking hate speech." Although Diamond had a lucrative law practice at the time, he decided then to change his priorities. "There's no point in having money if you're revolted by the country you're living in," he said. "And America is not immune to this." "We've got to return power to the people," he said. Diamond suggested that "middle America," like "middle England," is fearful that the country people love is being taken away. The values common to its citizens are being removed. His advice to counteract this was threefold. "Children are pawns in an unprecedented social experiment with the most disastrous outcomes." he said. "We need explain this; liberals will lose the debate because their arguments are illogical and weak," Diamond said. "They cannot survive rational arguments. You need to create debate." However, be prepared to abandon false PC "respectability." "You're going to have to abandon respectability. You're not going to be liked by Harvard University or the mainstream media," he said, "but you might be heard because you'll be speaking intelligently." Secondly, we need to keep trying to develop major media contacts to publicize the truth. (As we've seen, the media instinctively wants to ignore these types of stories.) He pointed to front-page articles that British newspapers finally printed about the absurdity of anti-discrimination policies that target and discriminate against Christians only. For example, British Airways employees have been banned from wearing even small cross necklaces, but allowed to wear turbans, Hindu ponytails, or any other jewelry with religious symbolism. This made the front page of a major UK newspaper. Some media personnel will see the light, he said, and others might listen because the story will sell papers. Finally, Diamond said, pro-family activists must exchange information across borders - help each other out, as the opponents already have been doing with great skill. Much of the world's future still follows America's lead, he said. "You've been leaders of the free world not because of your wealth but because of your values." "You have to act now. We waited too late in Britain, He said. He went on to say that you don't want a situation where -- like in the case of the 70-year-old man -- you're charged with inciting your own attack. They are imposing a new morality. And though much of it is being built through obscure things such as housing regulations, anti-discrimination codes, etc., it all adds up to a totalitarian atmosphere. "We've got to return the power to the people," he said. But we're living in a 'fool's paradise" if we expect this to happen without work and sacrifice. And he said that MassResistance is a group that people must support to get the job done. And as for the Brits, he said, "We're fighting to win. We're not retreating." There's one big key to his success. If nothing else, Paul Diamond is the kind of lawyer we wish we had here, but rarely find. He's a pro-family version of the ACLU lawyers who always wipe the floor with us because they're smart, passionate, aggressive, fearless street fighters. Our lawyers - and we've seen this over and over - tend to be respectful, methodical, relatively passive, not great strategists, and generally afraid of offending liberals. What he has, you unfortunately probably can't teach. We don't want to sound unkind, but it's a big problem. And furthermore, he's willing to roll up his sleeves and get his hands dirty if necessary. Too many of our lawyers want to find an easy exit that may be a long-term strategic blunder. Also speaking at the banquet was Sally Kern, an Oklahoma state legislator. Kern described herself as minister's wife, a former high-school government teacher who ran and won for office in the "reddest state" in the union. 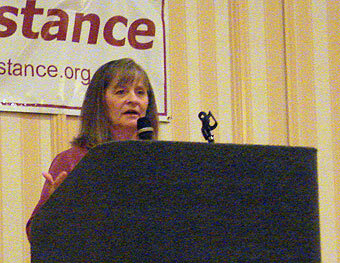 Sally Kern, State Representative from Oklahoma, addresses the MassResistance banquet. What motivates her, Kern said, is that she actually studied the Bible and America's Founding Fathers. "I just will never compromise the principles of God's truth," she said. Dr. Scott Lively, who has become a pro-family legend, came from Springfield and gave the benediction and closing remarks. As Paul Diamond said we must do, Dr. Lively has been working internationally. He talked about his recent pro-family successes in Eastern Europe and other countries. "We need to be starting with our neighbors but looking beyond our borders," he said. And he said that he thinks that the homosexual movement is much farther along here in America than most of us realize. But he made it clear that the counter-revolution takes root here. "We in this room, the people supporting MassResistance, are the ones who actually get things done. Starting with the simple stuff." If you missed it in person, this is really worth getting and listening to. 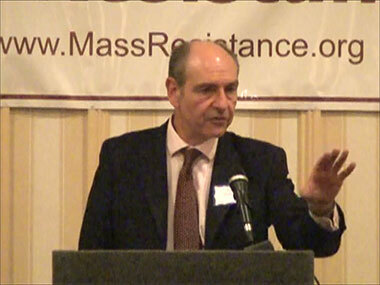 We are putting together a DVD and CD of Paul Diamond's speech and more from the MassResistance banquet. Watch this space for more details. Paul Diamond's message isn't exactly what the American mainstream media wants to talk about. But on Monday, Boston's Talk 1200 radio, the region's major conservative talk station (which also has Rush Limbaugh, Sean Hannity, etc.) had Paul Diamond on the morning drive-time Jeff Katz show and the afternoon drive-time Jay Severin show. He was also interviewed on some national pro-family shows. Listen to Paul Diamond on the Jeff Katz show (9:24 minutes).